COLOUR ME RED: THREADSLIKE INTERVIEW. NOTE: All images are by Dan Roberts from ThreadsLike. Who is the person behind "ThreadsLike"? Dino Dan. Admittedly this is a fairly recent name of which the origins can be put down to a notorious night during LMFF with the lovely ladies from StyleHunter, and Style Melbourne. Seems to be sticking though, so I’ll roll with it. How did "ThreadsLike" come about? ThreadsLike was in the making a long time before it actually took charge of a domain name and became something that I was prepared to show to the world. I was in Tokyo a few years back and I guess you could say I had a ‘moment’. Foreign smells, flashing lights from every direction, steam billowing from vents, black suits ducking into flash cars, heels, overcoats, wintery boots and mysterious faces. Something in this sensory overload that is Tokyo made me view cities in a whole new light. It gave me more perspective and respect for the streets and the people that walk them. I’d been working for a large New Zealand womenswear designer for a number of years in Auckland before I moved to Melbourne, but as soon as I landed here I knew it was time to start working on my own street style blog. Photography has always been a part of my life. My sister gave me my first camera when I was pretty young, and since then I’ve tried to always have a camera at my side. So I guess these things came together, had a little party and ThreadsLike was born! Many photographers like to capture street style, but I feel that yours has quite a unique point of view. Tell us what you look for on the street. You’re right, there are a lot of ‘streetstyle’ blogs out there these days. It’s grown so much in the last few years that you can even sub-categorize under the one umbrella now. I don’t look for specific fashion when I head out shooting, I’m looking for something that is more than just ‘good’ fashion. I would probably quite simply call it, style. I try to find cohesion between subject, fashion and environment. I think these three things are needed to really capture a great street style image. Style is something that can only happen when someone is totally comfortable with what they are wearing, and that’s something I’m a firm believer in. Style only occurs when the outfit matches the person’s mood or personality. That’s what I try to capture in my photographs - the personality of whoever it is that I’m framing up. Like any photographer, I look to tell a story in my photographs. I think street style has a lot more to offer than just a static head to toe, two-dimensional image of some clothes that someone’s wearing. How does Melbourne's street style compare to other major cities overseas? What makes us quintessentially 'Melbourne'? I think the greatest thing about Melbourne streets is the diversity that you can find. Melbourne’s arts and culture is really strong and there are a lot of young students studying at the many Arts institutions around Melbourne. This contributes to people’s creative, experimental and fresh outlook into what they’re wearing. It has more of an impact on designers and fashionistas than some may think. There’s always so much going on in this bustling city (I can hardly keep up), which gets people out and about on the streets. A creative, diverse culture helps to build and maintain a fascinating street culture. And street culture is an integral part of getting the mould right for a great city. The vintage scene in this city is really relevant too. There are so many great little vintage boutiques dotted around, and they're definitely worth sifting through to find those gems. 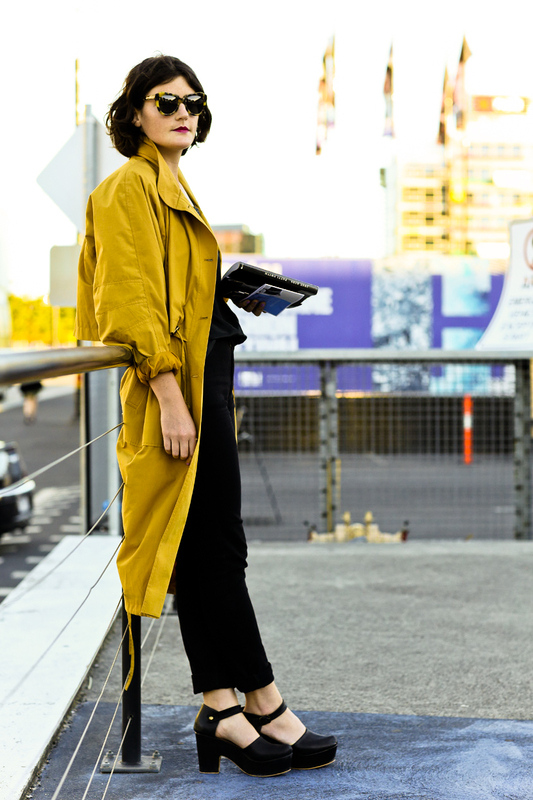 There's no doubt that vintage finds its way into so many Melbournians' wardrobes - I love hearing about how someone has thrown designer wears together with a bit of vintage to give it that ‘one of a kind’ look. I love seeing the people in your photographs standing in familiar streets of Melbourne. Do you have any favourite areas of the city to scope out stylish subjects? I wouldn’t say I have a particular favourite place to shoot, because what I love is the diversity that this city throws up. Northside of the city is quite experimental, and Southside has a more refined look. It’s important to look at different approaches to fashion, and different burrows have different ideas/looks that can be equally interesting. The city centre is probably where I spend the most hours on the street. There are places like the GPO building in town that has a natural romanticism, which makes for really beautiful backdrops in photographs. Collins Street consistently has really nice light throughout the day, and I explore laneways as much as possible. I still find myself discovering new hidden oases down streets I’ve walked a million times. I’ve definitely come to learn that it doesn’t matter where you are, you could walk around a corner in a seemingly dead part of the city and run straight into a beautiful frame. There has been much criticism regarding the authenticity of street style photography recently, particularly that which documents international fashion weeks. How do you feel about the evolution of street style photography? Do you feel it has been tainted by commercialisation and over-saturation? As long as the photographer can still convey a feeling, capture a style that is worthy viewing and essentially still tell that story within their photograph, then I think there is definitely still relevance. I just think that street style is still finding its feet after a huge growth period. It’s at that awkward teenage stage where your body grows really quickly and you suddenly find yourself clumsy; you knock things around and generally can’t put one foot in front of the other… It’s just going to take a little while to find that coordination again and to catch up with ourselves. If you find a street style photographer that you like, I think the beauty of following their content is seeing how it changes and being a part of that person’s evolution and journey. I personally think that we are at a stage where street style photography is more interesting than it has ever been. People have been forced to push themselves creatively, and the good street style photographers are coming up with some incredibly beautiful and provocative images. It’s just part of the evolution within the industry and seeing how designers will react to this new phenomenon is part of the intrigue. I’ve already heard of designers paring back/simplifying collections in response to the flashy shows that are happening on the streets outside. I think if something is so big it has the power to influence designers, then there is definitely relevance. As a flow on effect, the style on the street will reversibly be influenced by the designers, so it will be interesting to see where things go from here. I do think that there are a lot of publications that have jumped onto the street style scene and have totally missed the point. But that’s with any industry, and at the end of the day it’s up to the reader to choose what they consider to be good content and what they think is worth supporting. What other street style photographers do you admire / reference? The first street style photographer that I heard of and started seriously following was Scott Schuman, of The Sartorialist. Again, I can thank my inspirational sister for this introduction. I think Schuman is incredibly good at telling a story through his photographs, and he catches the essence of his subject like very few others can. Fairly recently, I’ve also been following a lot of what Tommy Ton is shooting. He brings a whole different aesthetic to the street style scene. I really like Ton’s attention to detail and the way he frames photographs is definitely an inspiration that I reference when I’m out on the street. I am definitely a perfectionist, and therefore I’m really critical of my own work. I look at what I consider to be the best content in the world because it’s how I keep pushing myself to be the best I can be. Where to from here? Any upcoming projects? L’Oreal Melbourne Fashion Festival was a great week and I met a lot of incredible people - some of whom have shown interest in collaborating in the future, which is really exciting. Next up though is Sydney for Mercedes Benz Fashion Week Australia. It’ll be great to see Sydney from my street style perspective. It’s always refreshing and inspirational going to new places, so I’m really looking forward to getting on that plane! I’ll skip back over to Auckland for New Zealand Fashion Week later in the year too. Aside from that, I’ll be back out on the streets of Melbourne tomorrow, hunting out those stylish birds and bears!